NEW DELHI: Enthused by successful conclusion of Bhushan Steel case, the finance ministry expects banks to write back more than Rs 1 lakh crore after the resolution of all 12 NPA cases referred to insolvency proceedings by the RBI it its first list. Last week, Tata Group acquired controlling stake of 72.65 per cent in the debt-ridden Bhushan Steel Ltd for around Rs 36,000 crore will help in cleansing the banking system as well as boost lenders profitability. 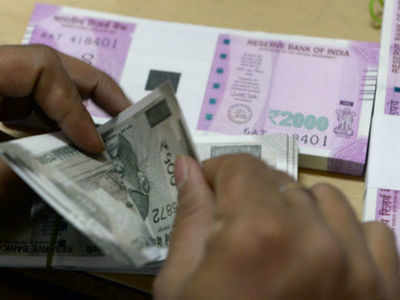 The remaining 11 NPA cases which are in the pipeline will easily bring to the table over Rs 1 lakh crore and the amount coming from resolution under the Insolvency and Bankruptcy Code (IBC) will directly add to the bottomline and help in reduction of NPAs of the public sector banks, a senior finance ministry official told PTI. Last year in June, RBI's internal advisory committee (IAC) identified 12 accounts, each having more than Rs 5,000 crore of outstanding loans and accounting for 25 per cent of total NPAs of banks. Following the RBI's advisory, banks referred Bhushan Steel Ltd, Bhushan Power & Steel Ltd, Essar Steel Ltd, Jaypee Infratech Ltd, Lanco Infratech Ltd, Monnet Ispat & Energy Ltd, Jyoti Structures Ltd, Electrosteel Steels Ltd, Amtek Auto Ltd, Era Infra Engineering Ltd, Alok Industries Ltd and ABG Shipyard Ltd to NCLT. These accounts together have total outstanding loan of Rs 1.75 lakh crore. The Kolkata Bench of the National Company Law Tribunal (NCLT) has already approved Vedanta Resources's resolution plan for acquisition of Electrosteel Steels last month. Besides, the NCLT last month also asked the lenders of Bhushan Power & Steel to consider the bid submitted by UK-based Liberty House for the debt-ridden company. Bhushan Power and Steel owes close to Rs 48,000 crore to banks and was referred to the NCLT by Punjab National Bank in June last year. Last week, Bamnipal Steel Ltd (BNPL), a wholly-owned subsidiary of Tata Steel, has acquired 72.65 per cent stake in Bhushan Steel by paying around Rs 36,400 crore, of which Rs 35,200 crore will be paid to financial creditors. The buy-out is expected to bring relief in the form of capital boost to PNB that was one of the leading lenders to the debt-ridden company, the bank said in a statement. PNB in a statement said the bank had the second highest exposure to Bhushan Steel and will benefit greatly from this acquisition. PNB sources say that the ledger outstanding to Bhushan Steel was Rs 3,857.49 crore while Rs 1,542.99 crore were earmarked for provisioning. With this resolution, PNB's NPA will fall by Rs 3,857.49 crore. While the bank will recover Rs 3,050 crore of the outstanding amount it will also be able to write off Rs 807.49 crore from the provision it had held for this NPA. The resolution will also have a direct impact on the bank's bottom-line this quarter. Sources say that this may have a positive effect on the bank's profitability to the tune of Rs 735.50 crore. On top of this, lenders including PNB will continue to own 12 per cent in the acquired entity giving them the opportunity to cash out later when the valuation of the company goes up. With a current market capitalization of Rs 598 crore at the rate of Rs 27.75 per share for Bhushan Steel Ltd., the share for lenders that stands at nearly 12 per cent, works out to be Rs 72 crore. Another state-owned lender Bank of India (BoI) said it would be able to realise around Rs 1993 crore from the first successful NCLT resolution of Bhushan Steel.